Your exterior lighting should not ignore your side yards. Not only are they good places for burglars to hide, they are ignored by many other homeowners. The lighting can be simple if you don’t have a lot of space between your home and your neighbor’s houses, and it can also be installed with infrared sensors to keep the lights off unless someone is on your property. This prevents the lights from bothering your neighbors but can scare away an intruder. Don’t forget about the environment when you plan your landscape and safety lighting. You should use LED lighting absolutely everywhere you can because it’s environmentally friendly and it lasts longer than old-fashioned halogen lights. Capable of lasting up to 100,000 hours, each LED bulb can also stand up to the outdoors better than halogen can. These lights handle inclement weather, shock, and vibration better than other options, and they can be dimmed and brightened to add depth to your design. It’s best to position your design ideas at dusk so you can see how they work in the dark. When you set everything up during the day, it might look good at the time but uneven and haphazard once the sun sets. Install and arrange as much as you can after dark. This way you can see how everything is lining up while you’re in the process of setting it up, and changes can be made easier rather than having to redo the whole thing. Finally, security experts such as Alder Home Security agree that all lights, outdoors and indoors, should be on timers. Unless you live in Arizona, once everyone “falls back,” it is dark by 6 p.m. You do not want a thief to think the house is empty, even if it is. You also do not want anyone slipping and falling on your property on the way to your front door. Use timers to turn on your beautiful landscape lighting to protect your home and those approaching it. If your home is automated you can program your automation to run through the same lighting sequence that happens when you are home. 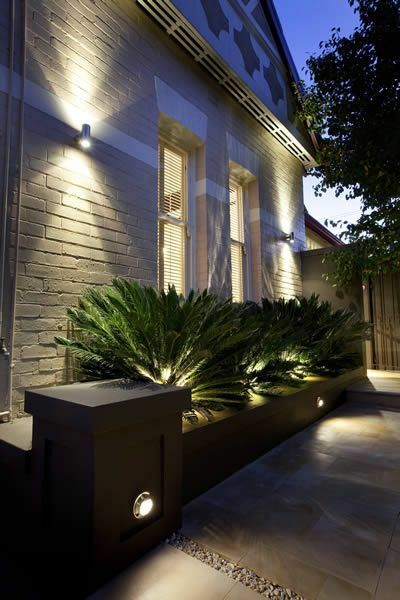 Exterior lighting is a fantastic way to revamp your home. It also increases its curb appeal, which can increase the value of your property, and that’s a good thing no matter what.